This past November was the hottest on record, with land and ocean temperatures a toasty 1.4 degrees Fahrenheit (0.78 degrees Celsius) above the average 20th century global temperature of 55.2 degrees Fahrenheit (12.9 degrees Celsius), according to data from the National Oceanic and Atmospheric Administration (NOAA). 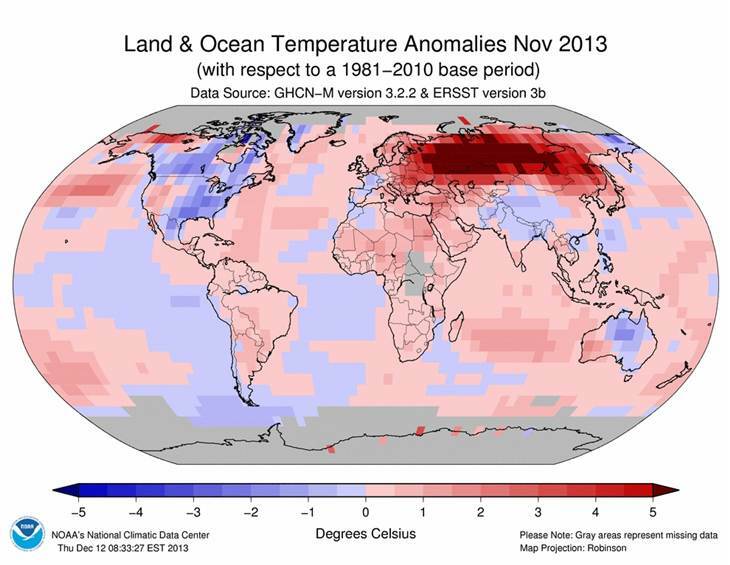 When only land temperatures are taken into account, this November was the second hottest on record. And don’t expect a break from the heat, either: 2014 may be even hotter than 2013. That’s because climate models are raising the odds of 2014 El Niño conditions, which warm sea water in the tropical Pacific and often raise global temperatures, according to data from the Climate Prediction Center and the International Research Institute for Climate and Society. If El Niño conditions prevail, they would be the first since the hottest year on record — 2010. El Niño conditions could make Southeast Asia and Australia drier and lessen rains in the Indian monsoon. The coast of California could also be battered by stronger storms in winter 2014, Quartz reported.